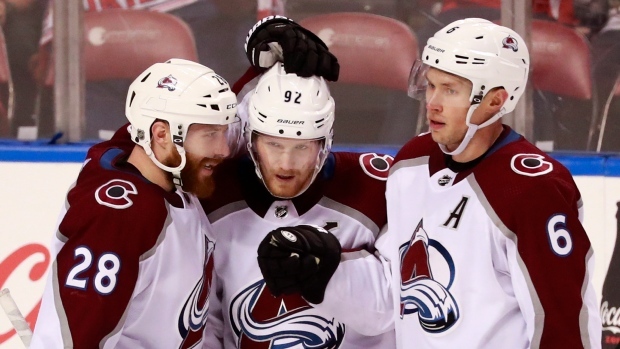 SUNRISE, Fla. — The Colorado Avalanche are making strides on the road. Carl Soderberg scored twice, J.T. Compher broke a third-period tie and Colorado beat the Florida Panthers 5-2 on Thursday night. The Avalanche won their 11th road game after winning only 15 all of last season. "It's just the hunger and the will to succeed from our guys," coach Jared Bednar said. "Maybe our expectations (last year) weren't high enough on the road and I think this year we're trying to take the next step and continue what we've been doing at home." Mikko Rantanen and Gabriel Landeskog also scored for the Avalanche. Philipp Grubauer stopped 33 shots. "We feel like every game we're there," Soderberg said. "We're feeling it right now and want to keep it going." Aaron Ekblad and Colton Sceviour had the goals for the Panthers. Roberto Luongo made 32 saves in his second game back from a knee injury. "They're a good team offensively and if you make mistakes, they're going to make you pay," Luongo said. "We had a good first 40 minutes and for some reason we didn't come out in the third. They popped two quick ones and that was it." The score was tied at 2 in the third before the Avalanche scored twice in 44 seconds. Compher put Colorado ahead when he tipped in a shot by Landeskog at 6:21. Soderberg's second goal of the game, a one-timer from the left circle, made it 4-2 at 7:05. "(We) were hounding the puck," Bednar said. "Maybe two or three pucks they kept alive just inside the blue line in order to extend the shift. When you do that, pressuring the puck, you're not giving them any time, you get tired down in there, and I think that's what happened." The Panthers challenged Soderberg's goal for goalie interference, but the call stood. "Their big line came out mid-shift (and) we got trapped in our end," coach Bob Boughner said. "We had three chances to get it out, all three failed, back of the net. They get the one on the very next shift and it's game over." Landeskog added an empty-net goal with 1:34 left. Soderberg snapped a 1-all tie with his short-handed goal. He took a shot from the right circle that hit Luongo in the face mask and bounced into the net at 5:44 of the second. The Panthers tied it about a half-minute later on Ekblad's power-play goal. Ekblad took a pass in the left circle and fired the puck past Grubauer at 6:19. Rantanen gave Colorado a 1-0 lead when he tipped in a shot from Patrik Nemeth at 10:40 of the first. Rantanen has a 10-game point streak. Sceviour tied the game 1-all after he redirected a shot in front from Bogdan Kiselevich with 2:07 left in the first. NOTES: Rantanen has 18 points (five goals, 13 assists) during his point streak and leads the NHL in assists (35) and points (47). ... Nemeth played his 200th NHL game. ... Panthers C Nick Bjugstad returned to the lineup after leaving the game against Boston on Tuesday in the third period. Bjugstad took a hit into the boards from Bruins defenceman Connor Clifton. Avalanche: Visit the Tampa Bay Lightning on Saturday. Panthers: Host the New York Rangers on Saturday.